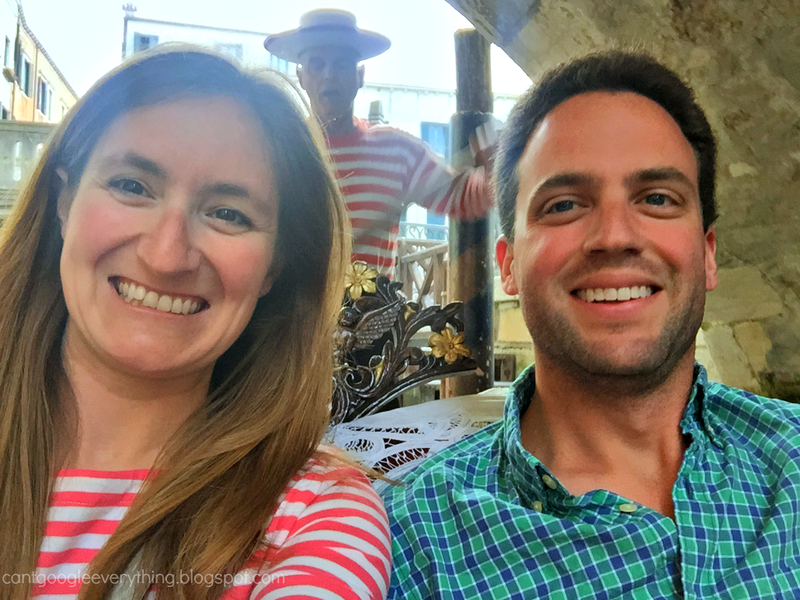 We just returned from our whirlwind trip to Italy and we had so much fun! We saw and did so much it’ll be hard to write about it all, we were doing stuff nonstop! Needless to say we did three things to the max: eat, sleep and take a ton of photos! We started off out trip in Venice! We arrived by train from the airport and stepped out of the train station into the hustle and bustle by the water taxi stop! Because the streets are cobblestone, uneven and full of tons of stairs and bridges, it’s much easier to take the water taxi to the stop closest to your hotel. I can’t imagine carrying our suitcases much more than we did! We actually flew into Milan, it was so much cheaper, and took the train to Venice from there! If you fly into Milan, you can take a shuttle bus (10 Euro) to the central train station and go to your next destination from there. It was a very smooth and easy transport. Our hotel in Venice was gorgeous! It looked like one of those hotel rooms you see in movies with a big living room, tall ceilings and furniture that you aren’t sure if you’re supposed to sit on or not! Our room had two balconies so after taking pictures of each other I set up my phone with the timer and ran over to the other side so we could take a picture together. The first night we basically walked around checking out the city and had our first Italian dinner. The next day we went to two islands off of Venice. 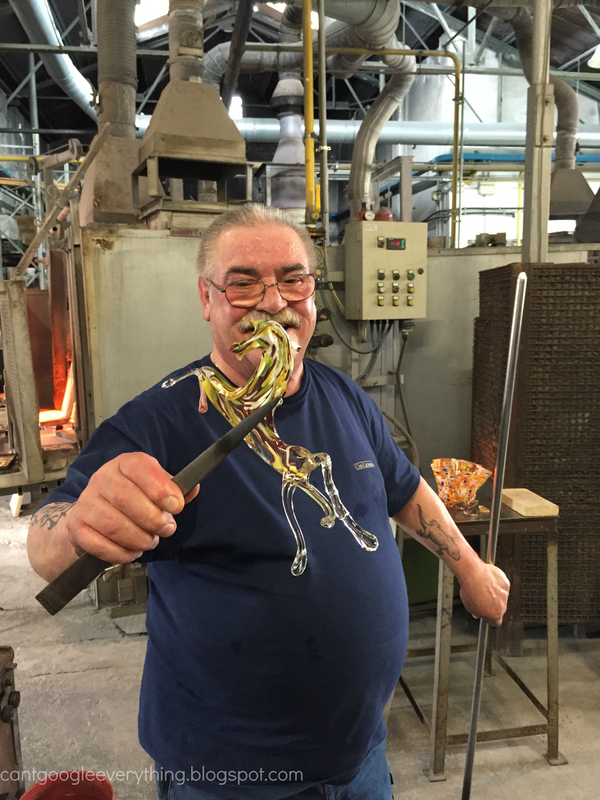 First, we went to Murano, which is the glass making island. I’ve always wanted to go here, so I was pretty excited! Our hotel included a free private “taxi” ride to the island, but you can also take the water bus over. We did a tour of the factory where they make all the glass by hand. I’ll be honest, it was a little gimmicky and sales-ey but it was still cool to see! Their techniques date back 100s of years from the 1500’s and are passed down in the family. They make blown class, like the bowl in the background, and pulled glass like the horse he’s holding. It was so hot that after he posed for this picture he lite his cigarette on it! You can see the furnace over his shoulder, they heat the glass up to 2000 degrees! Next we went to the nearby island of Burano, which is known for it’s lace making. We actually didn’t see much lace or people making lace or even very many lace shops but that’s okay. It was Sunday after all. The island is also known for it’s bright and colorfully painted buildings, which was pretty cool! Both of the islands have canals like Venice and people travel around by boat- no cars! Here’s my husband on one of the bridges over the Grand Canal! The church you can see in the background is not Saint Marks, which is on the left side of the canal in this photo, but Basilica di Santa Maria della Salute (St Mary of Heath). There are so many basilica’s it was hard to keep track! 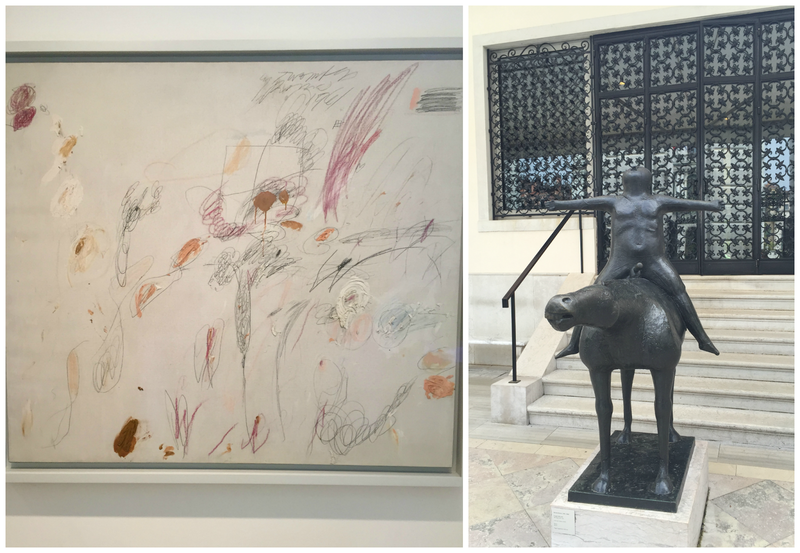 One notable place to visit is the Peggy Guggenheim Collection (15 Euros), which is one of the premier museums of modern art to visit in Europe. I am personally not a big fan of modern art, but to each his own. The museum had some fabulous works, such as the two you can see above. And no, that one on the left isn’t a drawing I framed from my toddler! “Modern art.” Joking aside, they did have a very good special exhibit showcasing works of Charles Pollock which runs through September 14. You weren’t allowed to take photos of his work, but you can also see some on display at MoMA in NYC if you’re interested. The building was also pretty cool, and right on the Grand Canal, so you could go out back and sit on the steps to watch the canal traffic go by! 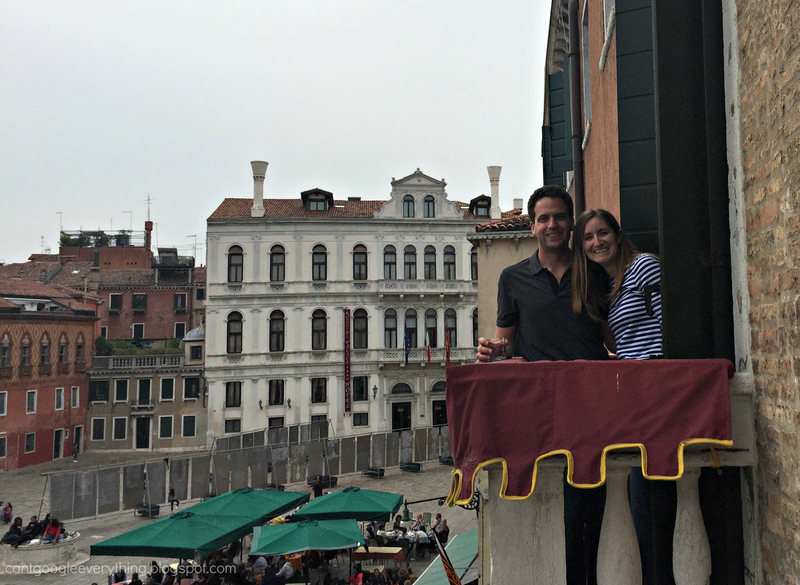 Another spot worth visiting is Saint Mark’s Basilica! It is a gorgeous cathedral connected to the doge’s palace (also worth visiting!) and was both of our favorite churches we saw in Italy. A good thing to know is that you can buy special tickets to skip the line for 2 Euros each and it’s well worth it! The line was huge! Buy online ahead of time and have your hotel print them out. There is also a pretty cool museum in the upstairs area of the church, which cost 5 Euro per person, but has some really cool artwork, old impressive statues and great views of the inside of cathedral as well as the square. You can actually go out on the roof from here and see a great view of the square from three sides, which is where this picture was taken! As a sidenote, please do not buy a selfie stick from one of the annoying peddlers. Just do it the old fashioned way and ask a fellow tourist to take your photo! Selfie sticks are quite annoying in these crowded tourist areas, and some of the places we went to even had signs up requesting you not use them! We ended our last full day in Venice with a stereotypical gondola ride! While it did feel a little cheesy, it was also pretty fun and a great way to see around the city. 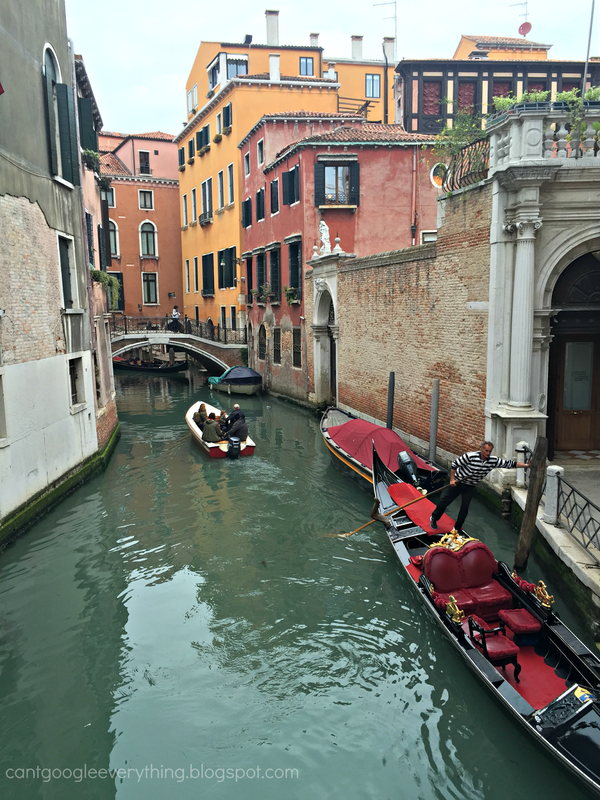 Venice was very beautiful and fun to see, but we probably won’t be going back any time soon! It was also quite crowded, especially on the weekend and everything just felt a little too touristy. 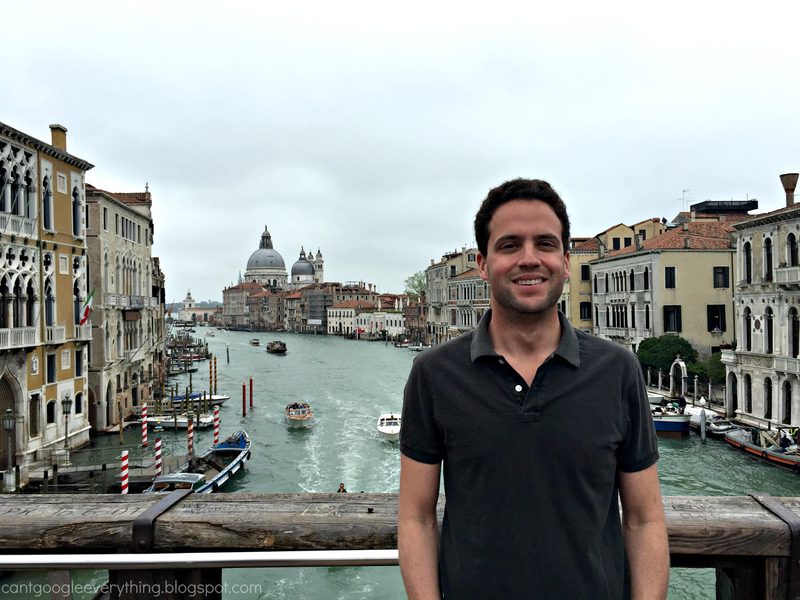 You can basically walk around and find great restaurants anywhere to eat, so don’t get pulled in by the overpriced places on Saint Mark’s square! We found plenty of great bars and places to eat and the wine is especially affordable! Be sure to bring very comfortable walking shoes and expect a lot of stairs! Venice is not a great place to bring a stroller (or young kids for that matter) because of all the stairs! Next we headed to Rome, which I’ll share all about next time! Ciao! I went to Italy 15 years ago. It was the first time I ever flew and went abroad. It was amazing and beautiful! One of my favorite places was Saint Mark's Basilica. That place is breath taking! We did Florence, Venice and a day trip in Milan before I did an overnight train back to Rome to fly out. Looks like you guys had a hell of a time! Such beautiful pictures! I especially like the buildings in Burano, but all of the architecture in Europe seems to be so exquisite compared to the built up, modernized buildings here in the states. It looks like you had a great trip! Italy has always been on my bucket list but reading this post makes me want to make it happen sooner rather than later! Especially before I have kids if it's not very kid-friendly! I love Italy! I've been to various regions there twice but never to Venice. It's def somewhere I'd like to go next time I go back! Looks wonderful. Must have been so fun exploring the city with your husband! Rachel, what a fun Post, you have me mesmerized with those tantalizing photos.Looks like a fabulous trip, I love all the old cathedrals in Europe each singularly beautiful to out of this world. Would love to have seen a couple of the foods you ate, or heard about them. Your husband's a cutie too. Looking forward to the Rome Post. Thanks Peggy! I am going to do a separate post for food & bev! Wow Rachel how exciting, I would love to go there. Great photos. I have always wanted to go to Italy. These photos are absolutely beautiful. 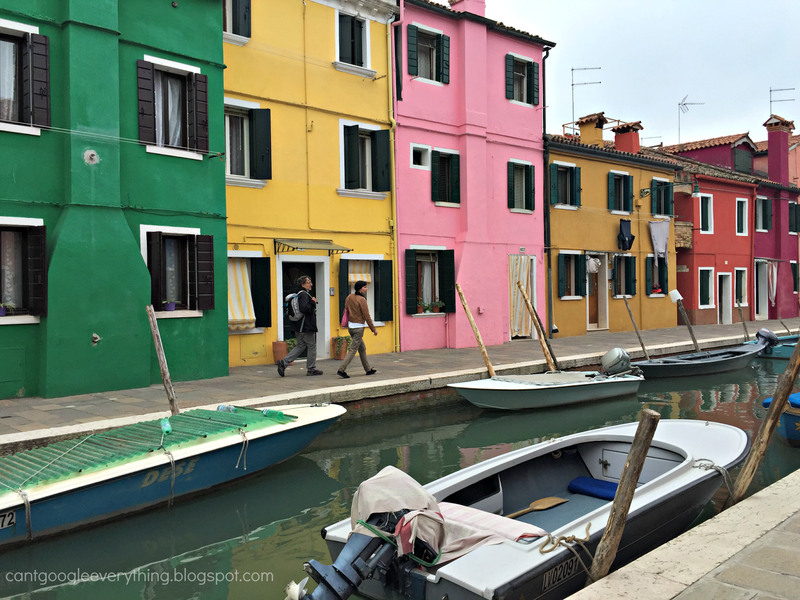 I love the little colorful buildings and riding through the canals looks absolutely breath-taking! Rachel, what a fun post. 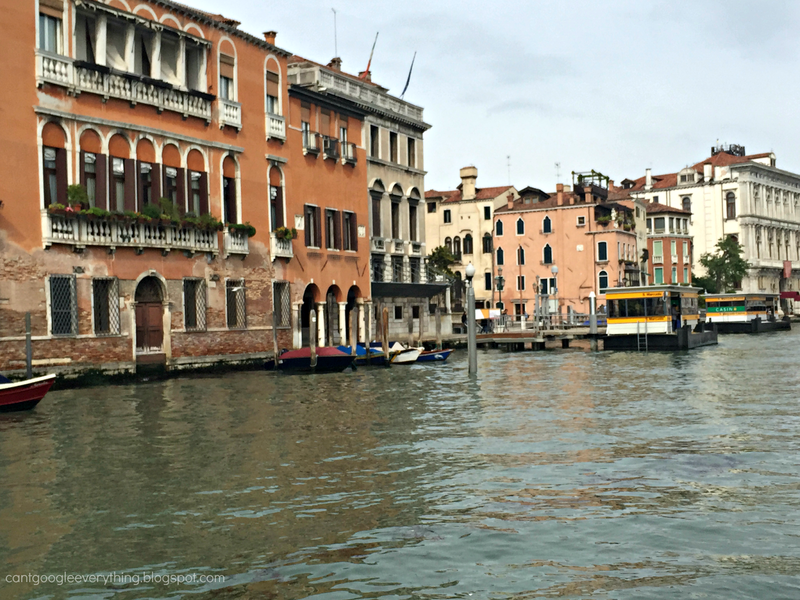 We went to Venice with the kids, but skipped the islands because we were told they were touristy (especially Murano). Glad we did, because my kids would have wanted to buy all those glass pieces! Beautiful photos and looks like you had a great trip! This looked so fun! I love reading posts about where others have traveled because I can get a glimpse as to what it looks like (even though pictures don't do it justice!) and add to my list of places I would live to go! What a great trip! Venice is on our list. Italy is so beautiful; it reminds me of Spain. France too…I guess all Latin countries are the same. Thanks so much for sharing! Kelly my husband said the same thing about Spain and Italy! I've never been to Spain, it's on my list though! love the colorful buildings. i can't imagine how beautiful it was there. i've never traveled interntaionally…it's definitely on my bucket list. 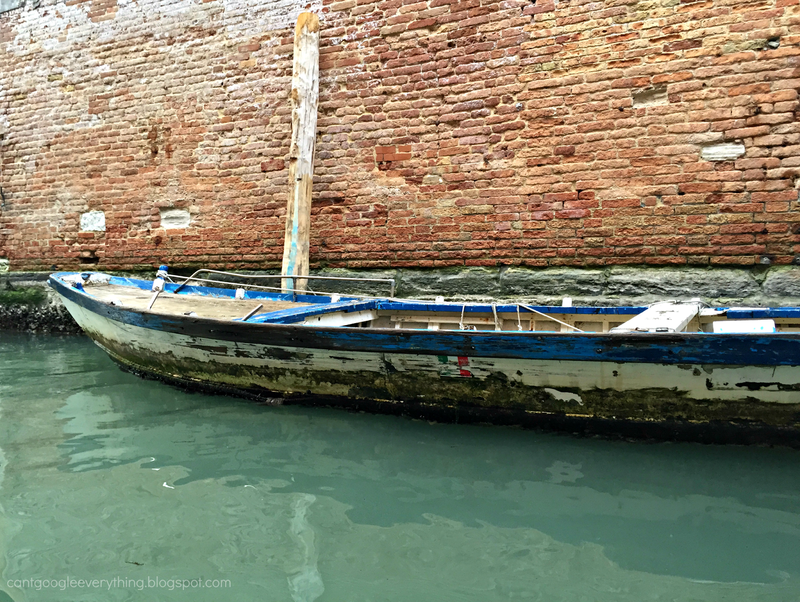 We will be in Venice at the end of June – I'm so glad I read your post. It got me excited and I took note of your tip to buy tix to St. Mark's ahead of time.